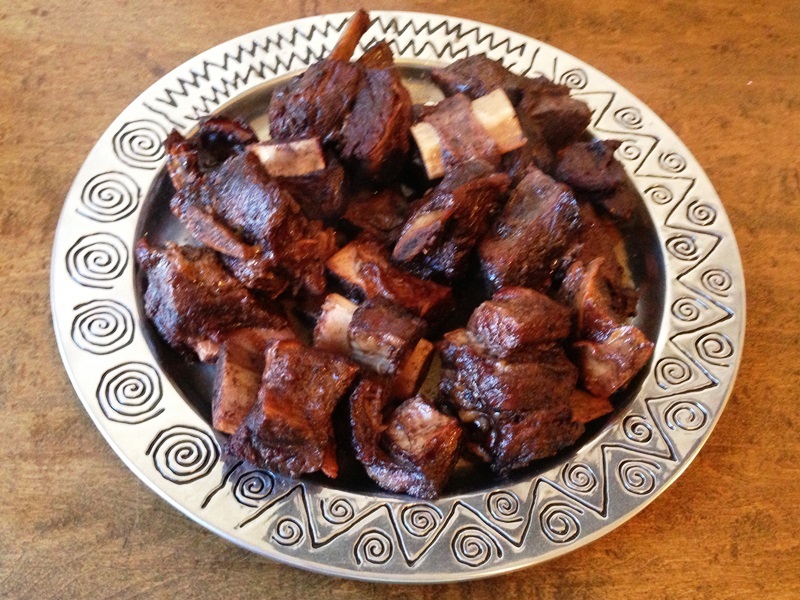 I’ve made short ribs many times now, some in the oven and some in the slow cooker. They’ve become a favorite to prepare and while rather simple, always seem to impress a crowd. This participate recipe, from Tom Colicchio and Food & Wine, has become by go to and ironically the first recipe I used to make short ribs. There have been many other recipes since and many other iterations, but I always find myself running back to it when I really want something special. The real trick is patience and time. No, there’s not a typo in the title. Yes, this recipe really takes three days. Now, wait, wait, wait! Don’t go panicking on me. A three-day recipe doesn’t necessarily mean slaving over the stove for 72 hours straight. In total, it takes maybe an hour or two of conscious cooking. The rest is set aside for marinating, braising and broiling. Day one you marinate your ribs in wine and veggies and day two you cook them long and slow, then chill the finished ribs overnight, separate from the sauce. The fat from the sauce rises to the top and hardens allowing you to easily scoop it off, then cook down the sauce to have a more flavorful accompaniment for your already amazing ribs. Day three is all about your sauce, then warming the ribs in your oven, then broiler to give them a bit of caramelized finish. The catch to the ingredient list is you need double what the recipe actually calls for. 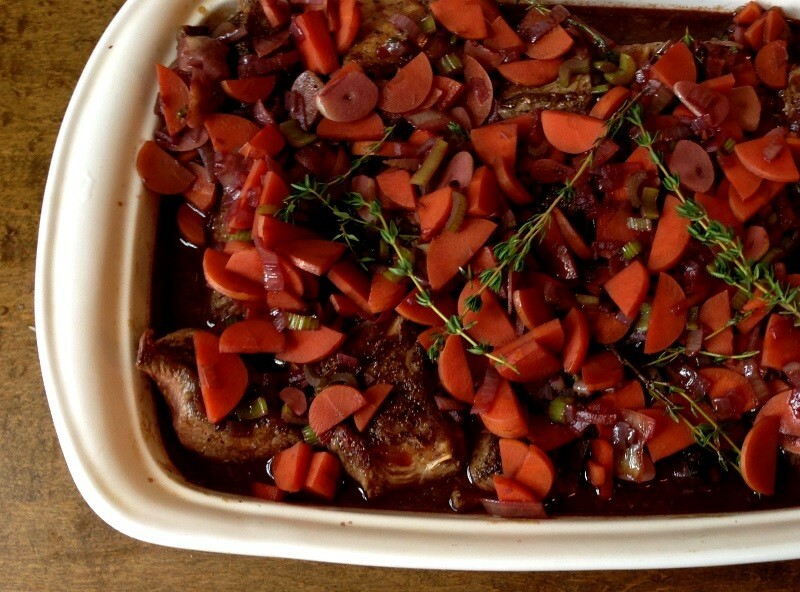 When I first read you were to marinate the meat with one batch of veggies, throw them out, and go with a fresh set for the actual braise, I was horrified. So much waste! But in truth, it really does improve the dish. Allowing to meat to marinate with wine and veggies overnight, you’re drawing out the essence of each ingredient into the meat and sauce, as you would if making stock. By adding fresh vegetables to the actual cook, you’re providing a new set of flavors to draw from, making the sauce that much more concentrated and delicious. Toss onions, carrots, celery and garlic together in a large bowl until well mixed. Divide in half; you will be using half for the marinade and the other half can be stored in refrigerator safe container until ready to cook on day 2 (this saves you the trouble of chopping vegetables two days in a row). In a large Dutch oven, heat oil. Generously season ribs with salt and pepper. Add ribs to hot oil, in batches if needed, searing on all sides until brown and crusty. Transfer ribs to a large shallow baking dish, keeping a single layer. After all ribs are seared, add vegetables and cook over medium-low heat until tender and lightly browned, about 20 minutes. Add wine and 3 thyme sprigs and bring to a boil over high heat. Pour hot marinate over ribs and let cool slightly. Cover with plastic wrap and refrigerate overnight, up to 24 hours, turning once. Preheat oven to 350°F. Working with your remaining vegetables, create a thin layer on the bottom of a large Dutch oven. Transfer ribs to Dutch oven and strain marinade over ribs, being sure to remove and discard used vegetables. Add remaining vegetables to pot, along with chicken stock and remaining 3 thyme sprigs, and bring to a boil. Cover Dutch oven and transfer to the lower, Transfer ribs to a large Dutch oven and place in the lower third of your oven. Cook meat for 2 hours until tender, but not quite falling off the bone. Uncover and continue to cook for 1 hour longer, turning ribs once or twice and until the sauce is reduced by about half. Transfer meat to a clean shallow baking dish, discarding any bones as they fall off. Cover and store in the refrigerator overnight. Strain sauce until a heatproof bowl or large measuring cup and chill in the refrigerator. 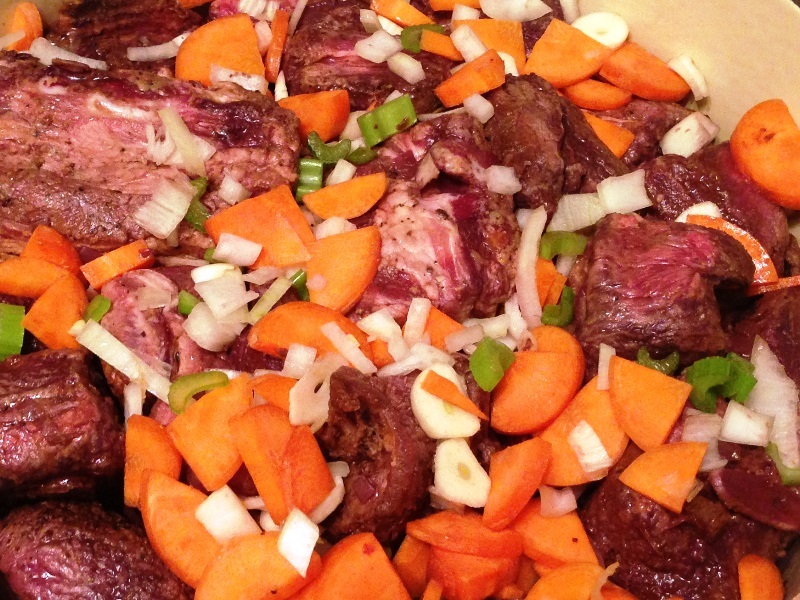 Remove meat from refrigerator and allow to warm to room temperature, about 2 hours. Meanwhile, remove sauce from refrigerator and scoop off fat that has hardened on top. Transfer sauce to a saucepan and bring to a boil. Reduce and simmer, uncovered, until sauce reduces by about a third and thickens slightly. Pour sauce over ribs and broil meat for 10 minutes, turning once or twice, until glazed and sizzling. Serve immediately with root vegetables and mashed potatoes, spooning additional sauce over ribs as desired. Labor of love for sure. Short ribs are one of my favorite meals. I will have to try your method. It sounds great. They might take some time but are certainly worth it! Wow and I am feeling tired after only two days in the kitchen. 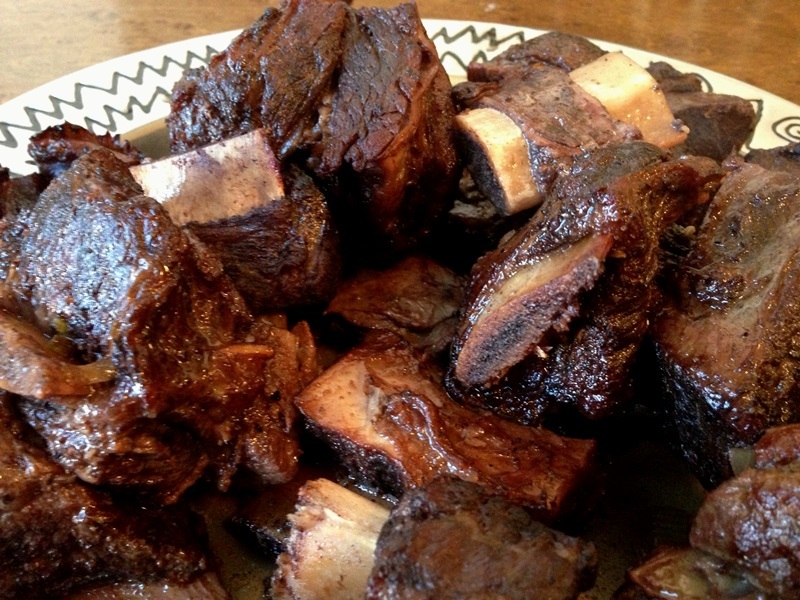 I’m not a short rib person but my husband would die for these. Maybe a birthday treat! Absolutely, Tammy. They’re certainly not an every day meal but for a special treat, go for it!